A newly renovated apartment community -- The District -- is transforming University City, bringing new life to a thriving neighborhood just minutes from Ladue, Clayton, Brentwood and the Delmar Loop. The District is located at 899 Longacre Drive on the eastside of Interstate I70. ST. LOUIS, MO--(Marketwired - Nov 6, 2013) - A newly renovated apartment community -- The District -- is transforming University City, bringing new life to a thriving neighborhood just minutes from Ladue, Clayton, Brentwood and the Delmar Loop. The District recently went through major renovations after being acquired by Freeman Webb Company, a private, full service real estate investment and management firm. The community is located at 899 Longacre Drive on the eastside of Interstate I70. The District is a modern, renovated community with 428-homes, ranging from one to two to three bedroom apartments. It offers six different open floor plans and gives residents two tiers of renovations to select from. 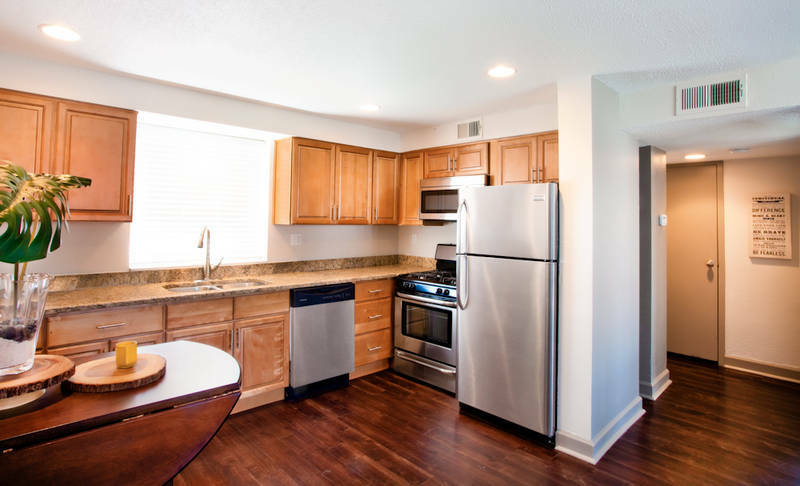 From inside out, The District has several new renovations including windows, laundry rooms, stainless steel appliances, energy efficient gas ranges, granite countertops, washers and dryers, and wood plank flooring. All of the homes have been upgraded with the latest technology, including CAT 5 wiring for high-speed internet. The District features a state-of-the-art fitness center, swimming pool, pet park, and coffee café. Private parking garages are also available. "We've taken an older property and transformed it into a community that now offers the best possible apartment living in University City," said Kent Burns, president of Freeman Webb. "With The District, we've created a completely new community that provides residents with the quality of home they deserve and the lifestyle they are seeking in University City." The location of The District is ideal -- it is just minutes from The Delmar Loop, downtown Clayton, Washington University and St. Louis University. Residents are nearby major employment, entertainment venues, high-end shopping, award-winning restaurants and vibrant nightlife of Clayton and the Loop. St. Louis Galleria, Brentwood Promenade and The Boulevard are just a few of the area shopping venues. Residents can enjoy breakfast, lunch or dinner at one of many local eateries, including Fitz's American Grill and Bottling Works, Maggiano's, First Watch Daytime Café, House of India and Jilly's Cupcake Bar and Café, or enjoy the day at the St. Louis Art Museum, The Pageant, Blueberry Hill, Busch Stadium, or Verizon Wireless Amphitheater. Additionally, the communities are connected to Clayton via the new Centennial Greenway. For more information, visit http://www.thedistrictstlouis.com.